A sugar-free dessert that actually tastes good? Okay, scratch that, it tastes better than plain good, it is simply supercalifragilisticexpialidocious! It is low-carb and exploding with healthy fat, perfect for the new Keto you. 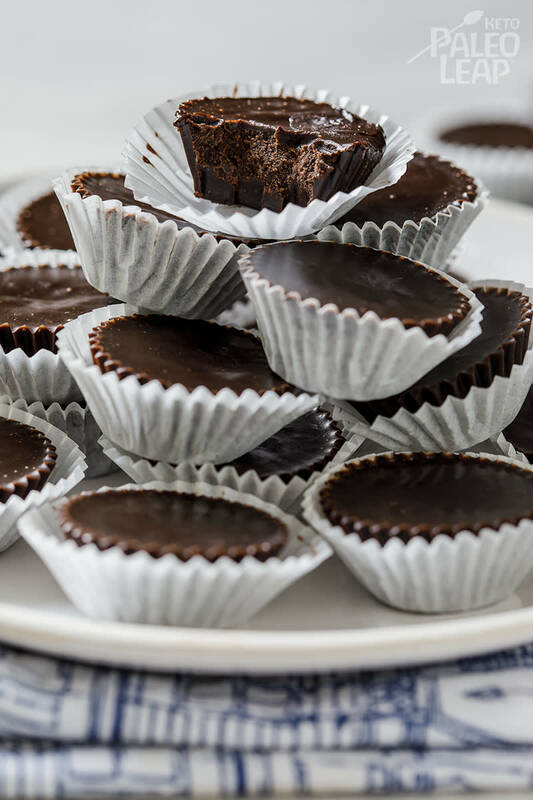 This recipe makes about 24 pieces, and a little bit goes a long way… The good news is that they will keep for up to 2 weeks in the fridge, so you can eat them bite by bite to chase away any lingering cravings that try to catch you off guard during the day. Refrain from the midnight snacking, if you can, they will slumber nicely in the cold till morning comes around. You will need to find the perfect almond nut butter, without added sugar, for the best fat bomb results. Forage your store shelves for the best brand and if you still can’t find the right one, you can definitely make the almond butter at home, saving a little cash in doing so. Here’s how: soak 1, 2, or 3 cups of organic almonds overnight in water; the next morning drain the excess moisture and blend on high in a food processor for about 5 minutes until you reach a desired consistency. There is no need to blanch them first, just soak them as they are. You can also start with raw un-soaked almonds, but it will first look like flour before it turns to butter in the blending process. Technical details aside, if you are keen on using up some more of that lovely almond butter, you could also indulge in a spinach-blueberry frozen smoothie. Just limit the banana to about half, or use a small one and you can get on your low-carb way. Pour mixture into small molds of your choice. Place in the fridge and allow to set for at least 2 hours. Once set, transfer to airtight container and keep in the fridge for up to 2 weeks. Makes approximately 24 fat bombs.